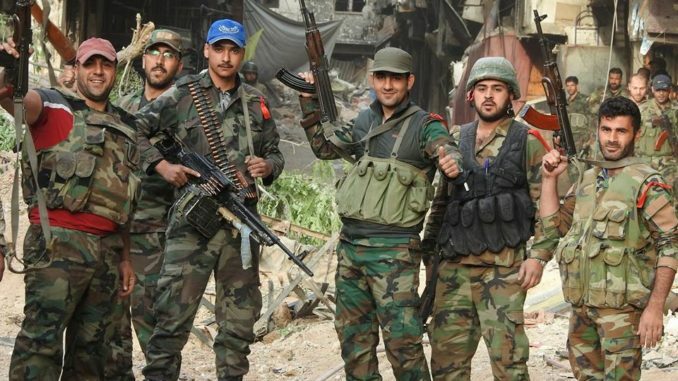 Since the declaration of Eastern Ghouta free of Islamist armed groups on 15 April 2018, many Syrians and observers asked about the next move of the Syrian Arab Army (SAA). On the ground, the SAA launched a military operation in the northern pocket of Homs, particularly in Talbiseh, and some towns in the eastern border of the Orontes River in the southern Hama countryside accepted the reconciliation offer with the mediation of Russia’s reconciliation centre. In addition, the SAA opened two important fronts; the operation to capture Eastern Qalamoun from Jaish al Islam where the government forces captured dozens of stolen tanks, armoured vehicles and American TOWs, and the operation to liberate Yarmouk Camp and Hajar al-Aswad from ISIS terrorists. The main military objectives of these operations are to secure the capital of Syria from any future terrorist threat which could serve as boots on the ground for regional and international powers seeking to overthrow the government in Damascusو and to secure a safe passage and transportation between main cities, particularly Damascus, Homs, Hama and Aleppo. This could lead us to another conclusion, that the SAA and its allies after achieving these objectives would declare a military operation to capture the areas under the control of Islamist armed groups in Daraa, the city that symbolizes the “revolution” which the anti-government camp declared against the current political system. The battle for Daraa is expected to be tense and regional powers could weight in, especially Israel and Saudi Arabia in order to prevent the advancement of SAA to the south. On the other hand, the Iranian and Hizbollah support for this battle would be decisive in resolving the battle. And the question remains: will the SAA and its allies form a popular resistance near the borders with occupied Golan Heights in order to liberate it? Time will tell. Just got bumped off your tweet, Glad to have found your web site. Been following on YouTube for too long sadly. Congrats Kervork for the new website. Well done Kevork. Your site offers an RSS-feed too. Maybe you can add a linked icon to your “connect”-widget. one ther faсtor thats not offered byy freelancing.